Hezbollah head restates threats to conquer Galilee in back-to-back interview, says his group, Syria and Iran will 'respond' to Israel. 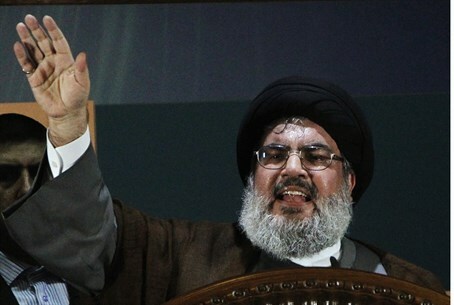 Hassan Nasrallah, leader of the Lebanon-based Hezbollah terrorist organization, threatened to attack Israel on Thursday, citing the pretext of reported Israeli airstrikes on missiles in Syria headed for Hezbollah. Nasrallah, who spoke in an television interview with Beirut-based Al-Mayadeen to be broadcast Thursday night, said his Iran-proxy Shi'ite terrorist group is well armed and always ready to fight Israel, according to excerpts of the interview issued ahead of its broadcast. The interview came after Nasrallah gave an interview on Tuesday in which he threatened to conquer Israel's Galilee region in the north - he restated that threat in the Thursday interview as well. A key ally of Syrian President Bashar al-Assad, Nasrallah said that reported Israeli strikes on Syria "target the whole of the resistance axis," which includes Hezbollah, Damascus and Tehran. "The repeated bombings that struck several targets in Syria are a major violation, and we consider that any strike against Syria is a strike against the whole of the resistance axis, not just against Syria," he said. "The axis is capable of responding. This can happen any time." The IAF has carried out several raids against terror targets in Syria, including depots storing weapons meant for Hezbollah to use against Israel, since the conflict there started nearly four years ago; Hezbollah has sent thousands of fighters into Syria to defend Assad's regime. The most recent strike was in December, when Israeli jets struck weapons warehouses near Damascus, according to the Syrian Observatory for Human Rights monitoring group. Israel has never confirmed it carried out the strikes, but it says it has a policy of preventing arms transfers to terrorist groups including Hezbollah. It was widely reported that the December strikes had targeted arms convoys or depots of Iranian-made rockets. The last major conflict with Hezbollah was in the 2006 Second Lebanon War, when Hezbollah missile strikes forced Israel to defend its northern border. In Thursday's interview, Nasrallah said his group was ready to fight a new war against Israel in Lebanon and renewed a threat to invade the Galilee region of northern Israel. Hezbollah fighters "must be prepared", he said. "When the resistance (Hezbollah) leadership...asks you (fighters)...to enter into Galilee, that means the resistance must be ready to enter into Galilee and to go even beyond the Galilee." Asked about Hezbollah's arsenal, Nasrallah said the group had "all (the weapons) you can imagine...and in great quantities." He added: "We are now stronger than we ever were as a resistance movement."